Beirut-Online News Network . : Peace in the Middle East: Scientific solution to a political problem? :. Peace in the Middle East: Scientific solution to a political problem? Peace in the Middle East is easily within our grasp, as indicated by a new scientific paper published in the "Journal of Scientific Exploration" on 29 June 2009. The new analysis addresses this question more thoroughly than previously. It presents new statistical evidence that all credible conventional explanations - such as military and political events, public holidays, and the weather - could not explain the observed statistically significant changes in sociological variables shown in an earlier study on the influence of groups practising the TM-Sidhi programme (Orme-Johnson DW, Alexander CN, Davies JL, Chandler HM, & Larimore WE. International peace project in the Middle East: The effect of the Maharishi Technology of the Unified Field. Journal of Conflict Resolution 1988 32:776-812, findings illustrated above). The observed changes in the Middle East included reductions in war deaths of 75%, war intensity of 45%, in crime of 12%, in fires of 30%, plus there were improvements in national mood of 27% and the stock market of 7% during the experimental period. Brain research has found that Transcendental Meditation increases coherence in brain functioning. Lead author of the new study David Orme-Johnson, former Chairman of the Psychology Department at Maharishi University of Management, suggests that: "Given the assumption of Maharishi’s theory that individuals are the units of collective consciousness, increased coherence at the individual level could be expected to have a positive effect on the population level". A coherence-creating group of 10,000 people could be established for less than 0.2% of the world's military expenditure, and yet, according to the research, could ensure a stable state of world peace. Ken Pease, Professor of Criminology at the University of Huddersfield, Chairman of the Belfast-based Centre for the Independent Research and Analysis of Crime, and Home Office adviser. Ted Robert Gurr PhD, Professor of Government and Politics, University of Maryland. "I want to express my support for this research. What we are really looking at here, I think, is a new paradigm of viewing crime and violence; and the new paradigm says, look to the individual acting in concert with other individuals to reduce crime constructively.... Having worked extensively on social problems in the District of Columbia for some 24 years at the University of the District of Columbia ... I'd like to encourage taking this new idea very seriously ... I would like to recommend that this new model that is being offered and advanced here, after a number of exhaustive and very carefully controlled studies, be considered, and that we think about ways that it might be implemented in the inner city with youth and community people who live here." Anne Hughes, PhD, Professor of Sociology and Government, University of the District of Columbia. Transcendental Meditation is an effortless technique practised for 20 minutes twice a day sitting comfortably with the eyes closed. Transcendental Meditation is not a religion or philosophy and does not involve any belief or change in lifestyle. Over 350 peer-reviewed research studies on Transcendental Meditation confirm a range of benefits for mind, body, and behaviour. For a printable research review, see http://www.t-m.org.uk/research.shtml. Several studies have compared the effects of different meditation practices and found that Transcendental Meditation provides deeper relaxation and is more effective at reducing anxiety, depression, and hypertension than other forms of meditation and relaxation. In addition, no other meditation practice shows the widespread coherence throughout all areas the brain that is seen with Transcendental Meditation. The TM-Sidhi programme is an advanced aspect of Transcendental Meditation. The TM-Sidhi programme develops mind-body co-ordination, and strengthens the ability to fulfil desires. Scientific research has repeatedly demonstrated that the TM-Sidhi programme creates a powerful influence of positivity in society, especially when practised in groups. First indications that crime decreases when 1% of a city practises Transcendental Meditation. The phenomenon was called the Maharishi Effect as Maharishi Mahesh Yogi, the founder of the Transcendental Meditation technique, first predicted it in the 1960s. First study on the Maharishi Effect was published in the peer-reviewed Journal of Crime and Justice. International Peace Project in the Middle East published in 1988 in the Journal of Conflict Resolution based at Yale, which indicated the possibility of peace in the Middle East. Three experiments that showed that a group of 7000 Yogic Flyers could create an influence of coherence in the whole world. Experiment in Washington, D.C., evaluated by board of 27 independent scientists. 4,000 Yogic Flyers reduce violent crime by 23%. Re-launch of projects to create permanent groups of Yogic Flyers in every nation beginning in Holland and USA. Permanent group of Yogic Flyers in Iowa, USA exceeds national “Super-Radiance” threshold of the square root of 1% of the population. E: Selected research articles on the Maharishi Effect, showing changes in conflict, crime and other sociological indicators. P. Gelderloos, M.J. Frid, P. Goddard, X. Xue, and S.A. Loliger, "Creating World Peace through the Collective Practice of the Maharishi Technology of the Unified Field: Improved U.S.-Soviet Relations,"Social Science Perspectives Journal 2(4) (1988), 80-94. D.W. Orme-Johnson, C.N. Alexander, J.L. Davies, H.M. Chandler, and W.E. Larimore, “International Peace Project in the Middle East: The Effects of the Maharishi Technology of the Unified Field,” Journal of Conflict Resolution 32(4) (1988), 776-812. D.W. Orme-Johnson, C.N. Alexander, and J.L. Davies, "The Effects of the Maharishi Technology of the Unified Field: Reply to a Methodological Critique," Journal of Conflict Resolution 34 (1990), 756-768. D.W. Orme-Johnson, M.C. Dillbeck, C.N. Alexander, H.M. Chandler, andR.W. Cranson, "Effects of Large Assemblies of Participants in the Transcendental Meditation and TM-Sidhi Program on Reducing International Conflict and Terrorism," Journal of Offender Rehabilitation 36(1-4) (2003), 283-302. J.L. Davies and C.N. Alexander, “Alleviating Political Violence: Impact Assessment Analyses of the Lebanon War: Impact Assessment Analysis of the Lebanon War,” Journal of Social Behaviour and Personality 17(1) (2005), 285-338. M.C. Dillbeck, G. Landrith, D. Orme-Johnson. "Transcendental Meditation Program and Crime Rate Change in a Sample of Forty-Eight Cities," Journal of Crime and Justice 4 (1981), 25-45. M.C. Dillbeck, C.B. Banus, C. Polanzi, and G.S. Landrith III, "Test of a Field Model of Consciousness and Social Change: The Transcendental Meditation and TM-Sidhi Program and Decreased Urban Crime," The Journal of Mind and Behavior 9(4) (1988), 457-486. M.C. Dillbeck, "Test of a Field Theory of Consciousness and Social Change: Time Series Analysis of Participation in the TM-Sidhi Program and Reduction of Violent Death in the U.S.," Social Indicators Research22 (1990), 399-418. P.D. Assimakis and M.C. 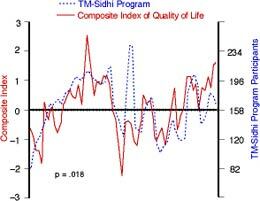 Dillbeck, "Time Series Analysis of Improved Quality of Life in Canada: Social Change, Collective Consciousness, and the TM-Sidhi Program,"Psychological Reports 76 (1995), 1171-1193. G.D. Hatchard, A.J. Deans, K.L. Cavanaugh, and D.W. Orme-Johnson, “The Maharishi Effect: A Model for Social Improvement. Time Series Analysis of a Phase Transition to Reduced Crime in Merseyside Metropolitan Area," Psychology, Crime, and Law 2(3) (1996), 165-174. M.C. Dillbeck, K.L. Cavanaugh, T. Glenn, D.W. Orme-Johnson, and V. Mittlefehldt, “Consciousness as a Field: The Transcendental Meditation and TM-Sidhi Program and Changes in Social Indicators,” The Journal of Mind and Behaviour 8(1) (1987), 67-104. D.W. Orme-Johnson and P. Gelderloos, "The Long-Term Effects of the Maharishi Technology of the Unified Field on the Quality of Life in the United States (1960 to 1983)," Social Science Perspectives Journal 2(4) (1988), 127-146. J.S. Hagelin, M.V. Rainforth, D.W. Orme-Johnson, K.L. Cavanaugh, C.N. Alexander, S.F. Shatkin, et al. "Effects of group practice of the Transcendental Meditation program on preventing violent crime in Washington, DC: Results of the National Demonstration Project, June-July, 1993." Social Indicators Research 47(2) (1999), 153-201. Brown, C.L. "Overcoming Barriers to Use of Promising Research among Elite Middle East Policy Groups," Journal of Social Behaviour and Personality 17(1) (2003), 489-546. Pajhwok Afghan News, USA Today "Topics", The Huffington Post, The Seoul Times 1, The Seoul Times 2, Aljazeera Magazine, PakTribune, Alarabiya, Congo Forum, Sri Lanka Guardian 1, Sri Lanka Guardian 2, Nepal Monitor, Pakistan Daily, The Bottom Line, Arab News, Pakistan Link, The Colombo Times, Middle East Online, Hi Pakistan, India Features, Soldier of Africa, Frontier India Strategic & Defense, Sentinel Review, Congo Watch, Beirut-Online, India Defence Consultants, The Pakistani Spectator, Senegambia News, Media For Freedom, Broadcast India, Fiji Daily Post, News From Bangladesh, Muslim, Webnewswire, Intent, United News Network, News Wing, Frontier India World Affairs, Muslim World Today, Sinhala, Defence Talk, MEPeace, Southern Asian Outlook, Northern News Lines, Sudan Watch, Blitz, New Age Islam, Haalkhabar, The Earth Times, Rantburg, Newstrack India, Uganda Watch, The Morung Express, Chowk and Islam And Muslims. Dr. David R. Leffler, (18 March 2009) Terrorism Trends, 54. Militant Islam Continues To Spread and Gain Power. International Exposure Includes a Growing Risk of Terrorist Attack - Expert Comments - Leffler [about Invincible Defense Technology]. In "55 Trends for Cyberwar." Presented by Dr. Marvin J. Cetron, President, Forecasting International at Future of Information Warfare and Information Operations, Sponsored by JIOPO, CIA, DIA, and NSA U.S. Army War College, Carlisle, PA, Dr. Leffler's comments appear on pages 136-138 and page 141. Dr. David Leffler, (2008) presentation on the topic of Invincible Defense Technology at the Marcus Evans Defense sponsored "5th Annual Countering IEDs - Assessing the IED Threat and its Evolution on the Battlefield and in the Homeland" conference in Washington, DC. This three-day conference attended by scientists and leaders with the military, FBI, and police included his presentation entitled: "Invincible Defense Technology (IDT) as a Means to Prevent the Implementation of IEDs". See also the Invincible Defense Technology News article entitled "Dr. Leffler Presents at Military and Law Enforcement Conference." Dr. David R. Leffler, (in press). A New Role for the Military: Preventing Enemies from Arising-Reviving an Ancient Approach to Peace. Paper is accepted for publication in the Journal of Management & Social Science (JMSS), Institute of Business & Technology BIZTEK in Pakistan. The abstract appears in Session 6, p. 44 of the proceeding of the "International Sociological Association Research Committee 01 Seoul National University & Korea Military Academy International Conference on Armed Forces & Conflict Resolution in a Globalized World." July 14 - 17, 2008, Seoul, Korea. Also presented at KIDA, the Korea Institute of Defense Analyses. Dr. David R. Leffler, (2008, November). News from RC101 members. Letter about Invincible Defense Technology by Dr. David Leffler, Executive Director at the Center for Advanced Military Science (CAMS) at the Institute of Science, Technology and Public Policy to retired Italian General Giuseppe Cafrio, the President of the Research Committee on Armed Forces and Conflict Resolution RC01 for the International Sociological Association. Dr. Cafrio published the letter in the Armed Forces and Conflict Resolution November 2008 Newsletter. Col. Brian M. Rees & Dr. David R. Leffler, (Abstract). Stress reduction using the TM program: Solution to problems arising from combat stress. In the proceeding of the "International Conference on Armed Forces & Conflict Resolution in a Globalized World" July 14 - 17, 2008, Seoul, Korea, Session 3, p. 16. Col. Brian M. Rees (Abstract). The Application of Strategic Stress Management in Winning the Peace. In the proceeding of the "International Conference on Armed Forces & Conflict Resolution in a Globalized World" July 14 - 17, 2008, Seoul, Korea, Session 12, p. 87. Col. Brian M. Rees (2007). US Army War College masters program degree research paper "The Application of Strategic Stress Management in Winning the Peace. Available at: http://invinciblemilitary.org/rees/Col_Rees_Masters_Paper.htm Dr. Rees gave a presentation on this topic at the Association of Military Surgeons of the U.S. (AMSUS) convention on 12 November 2007. Lieutenant Colonel (Ret'd.) Gunter Chassé (1995) White Paper On the New Security and Defence Policy of the Federal Republic of Germany and on the Future of the Bundeswehr -- English translation of the groundbreaking White Paper on why Germany should implement Invincible Defence Technology. David R. Leffler (1992 Spring). A new military science in Moscow. Insight, 3(1), pp. 14-15. Colonel (Dr.) Brian M. Rees, former Battalion Surgeon for the 310th Military Police Battalion at Camp Bucca, Iraq, builds a case for America to utilize Invincible Defense Technology to end terrorism. "There is research in the field of conflict resolution [Invincible Defense Technology] that shows great promise. But it requires that we think way outside the box. Hold on to your hats and I will introduce you to an approach that has held up under rigorous evaluation. Col. Rees completed his US Army War College research paper entitled on the topic of the Invincible Defense Technology, "The Application of Strategic Stress Management in Winning the Peace." See his recent coauthored editorial on the topic of Invincible Defense Technology in The Huffington Post. Project: Coherence - Lieutenant General José Villamil, the former Vice-Minister of Defense of Ecuador, used Invincible Defense Technology to quickly end Ecuador's war with Peru. He thinks the United States could prevent more wars and terrorist attacks. Article published by India Defence Consultants, a defense think tank. Operation: World Peace - Article in Defence India by Major General Guru Israni (editor of Combat Journal). He argues that the attacks of September 11th could have been prevented with this technology. Invincible Nepal: An Ancient Vedic Technology for Modern Security Challenges of Nepal - Article in Shreenath Journal, a military magazine in Nepal by Lt. Col. Jitendra Jung Karki. "Nepal's perspective in vedic studies is completely different than other countries and nepal has the capability for not only to explore the vedic concept of defence but also to lead the world with total concept of peace and security with its vedic population and vedic security forces." Major General Kulwant Singh In his press conference on the morning of 9/11/01 he said "I think with all of this [terrorism] today, America needs a new approach to protection." Invincible Defense Technology Proposed As Homeland Defense* - Article published in U.S. Medicine. Major Werner Klokow, an officer in the military of South Africa and the editor of Soldier of South Africa writes: "I find Quantum Physics fascinating and support a more holistic and/or unconventional approach to safeguarding South Africa. Foremost here is the practice of Invincible Defense Technology based on the Maharishi Effect. This proven technique has as its main obstacle in ignorance, which I hope to dispel to some degree." Lieutenant Colonel Gunter Chassé (Ret.) served 39 years in the German Air Force, mainly in the Integrated NATO-Air Defence. "[Invincible Defense] Technology is not just an idea. It is a practical method and is available immediately. It only needs to be applied. It has been shown to work many times, and its effect has been scientifically verified." Chassé was instrumental in the writing of the alternative White Paper on the New Security and Defence Policy of the Federal Republic of Germany and on the Future of the Bundeswehr. Recent article on Col. Chassé. He will give a presentation to NATO and EU leaders about using Invincible Defense Technology to prevent the implementation of IEDs at the "Countering IEDs Europe" conference in the Berlin, Germany on 21-22 October 2009. Designed and developped by T.A.M.